Other-Blamers engage in a wide range of behaviors, including making excuses, justifying, lying, and abusive anger, because they hate being found unworthy and hate experiencing shame. Here are some Other-Blamer behaviors to watch out for and what these behaviors say about the person’s emotional functioning. Other-Blamers and narcissists will use these tactics to shut down someone who confronts them. They do not like being questioned when they are wrong, so they will use freeze out behaviors to send the message: “Don’t you dare challenge me.” Other-Blamers feel unwarranted shame and blame when their failures are brought up. They learned, perhaps early in life through parental modeling of this distancing with them, to control and dominate others with emotional or physical rejection. This trains their partner to be less assertive or challenging, which creates a pattern where the Other-Blamer has free rein to act out and not be confronted for his misbehavior. Icing out can include more subtle behaviors of giving vague answers, emotional distancing, or just non-communication about plans, such as leaving the house without warning. Other-Blamers also may have a set of coded language and body language they use that communicates in subtext that partner best not be too assertive. In extremes, freezing out is abusive behavior that often escalates to physical intimidation: “If you don’t shut up, I’ll smack you.” In more subtle forms, this intimidation includes “dead eye” staring. One patient described how her husband was normally charming, easy-going, and pleasant, but if she questioned his decisions he would instantly grow silent and cold. He would stare at her in a very intimidating manner. This stare would only last for a few seconds, so she never gave it much weight, but it spoke volumes — and it worked because she would back down. When I hear of these behaviors, I can’t help but recall that we humans are not too far removed from our primate ancestors and chimpanzees and gorillas definitely engage in this sort of physical intimidation, including icy staring and murderous stillness. The key to spotting this behavior and others is to tune in to your own reactions. Most Self-Blamers are disconnected from their own emotions and intuitions, so that they don’t recognize a reaction, such as fear. When I asked this woman how she felt in that moment when her husband stared at her, it took her quite a while to ascertain that she had felt fear. Other-Blamers rely on this disavowal of or lack of attunement to one’s own emotions. They want their partners to feel the threats and kowtow, but to ignore the fact that this behavior is inappropriate. Most Self-Blamers are “people pleasers” who are over-focused on the needs of others and under-focused on self-protection. Because Other-Blamers are loaded with high levels of feelings of unworthiness, they struggle to accept any criticism or correction. They become defensive and cannot admit they are wrong or apologize. This makes it extremely difficult to be in relationship with them because they do not engage in healthy accountability and repair. We all make mistakes, but Other-Blamers do not like admitting this. They fear the shaming experience of vulnerability, so go to great lengths to avoid admitting inadequacy. This may include outright lies or lies of omission. 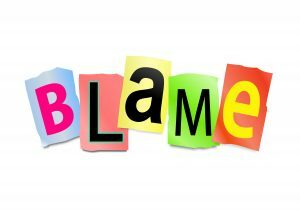 This is not direct blame-shifting but when Other-Blamers do not own their faults, their Self-Blamer partners often automatically accept the unwarranted blame. She may do this to keep the peace, but eventually even extreme Self-Blamers will begin to feel confused. She starts to recognize that logically she is not wrong about this issue or she didn’t do that thing. The facts start to catch up with the Other-Blamer, and the Self-Blamer make grow tired of always being the bad guy. Yet even in the face of direct evidence, the Other-Blamer may stubbornly cling to his delusions. Victims of narcissistic abuse often start to feel confused because these behaviors may not be as obvious as physical abuse, yet can have a devastating effect on the victim’s sense of stability and self-worth. They are subtle forms of gaslighting, in which an abuse victim is told she is “crazy” or imagining problems that don’t exist. Being lied to repeatedly is a distortion of reality that can shift a sense of normality. Many partners of Other-Blamers report widely different rules being applied: He can go out to the bar alone every night, but she never can go anywhere with friends. He can spend thousands of dollars on his hobby, but she can’t even buy a bottle of nail polish. This uneven application of relationship rules is a distortion of reality that creates a sense of mental confusion and submission in the abuse victim. They key to spotting Other-Blamer behaviors is to recognize that they are deeply self-loathing, but have adopted behaviors that mask that. They cannot tolerate criticism or accountability, so will engage in a range of behaviors to avoid this experience. Don’t be fooled. Learn to spot these behaviors. If you are Self-Blamer be aware of your habits of accepting unwarranted blame and tolerating unfair relationship rules. Then assertively stand up for yourself. If you get good at staying calm in arguments, you can call out the Other-Blamer for these tactics and that can be very empowering. Although the Other-Blamer will hate it that you have an inside track on their sneaky behaviors! Like it? Share it! Comment!